It is important to remember that promising to follow a dream “someday” never works because Someday is Not a Day in the Week. This book gives ten life hacks that can help you align your ultimate goals with your current reality. Are the life hacks new ideas that you have never heard before? No. However, the author has an enthusiasm for them that is contagious. The book is motivating! Unfortunately, it is aimed a bit toward the well-off members of society. For example, I can’t quit my job until I put in the 30 years necessary to get my pension plus I have to wait until I’m old enough for Medicare, which is a long time from now. I wish I could just jump off that cliff with the knowledge that my family will support me like a parachute. However, that is not reality and the book encourages thinking realistically about how to implement your goals. 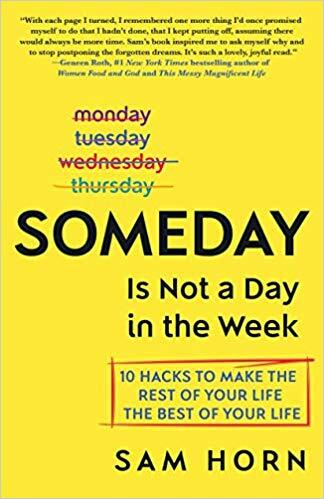 If you are in a position to take that first step to finding a job that brings you joy, Someday is Not a Day in the Week is the perfect book to motivate you to do it sooner rather than later. 4 stars!